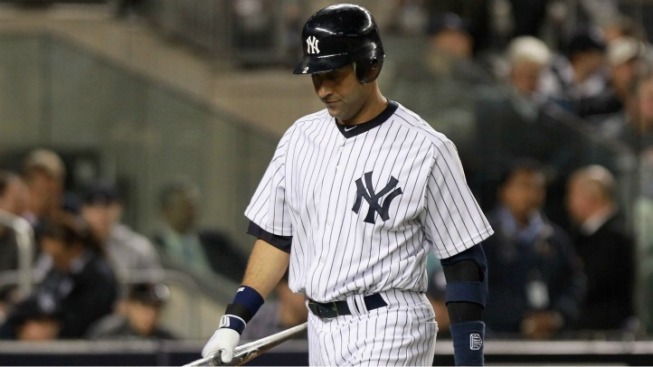 Don't start worrying about Derek Jeter just yet? It's never too early to worry about Jeter. Oh, wait, yes it is. Spring training is a long, drawn-out process that leaves everyone with an abundance of time to ponder things about the state of the Yankees. That can lead to some wacky trains of thought, one of which ran through the mind of Wallace Matthews and onto the pages of ESPNNewYork.com. Matthews writes that now that we've gone through the starting rotation once, it is time to move onto more pressing matters such as the performance of Derek Jeter. "On Wednesday, Jeter went hitless in two at-bats to drop his spring training average to .125. He has one hit in eight at-bats so far and has hit the ball on the ground in seven of those eight ABs (the other was a strikeout). He couldn't make his patented jump throw on a play that might have saved Hiroki Kurodaa run, and later he booted a routine grounder." It would be easy to kill Matthews for being a fool, but it's not like he's the only guy doing this kind of stuff and it's not like he doesn't go on to point out that Jeter's stats on March 8th matter about as much as a nudist's opinion on the fall fashion lines. Having said that, you have to wonder why it would even cross his mind as something worth jotting down. For a player like Jeter, who has been going to spring training for two decades and has no chance of losing his job, spring training isn't about results. It is about getting ready for the season to come and there's no on-field performance, especially not two games worth of at-bats, that's going to send a message about where Jeter is on that front. If Jeter is hitting .125 on May 8th, there's a story to be told but we're a long way from May 8th. The craziest part of the whole thing is that there's actually worthwhile stories to discuss about the Yankees. Relief pitcher David Robertson fell down some stairs and sprained his foot. X-rays were negative, but Robertson is having an MRI and walking with a limp. We have no idea what the prognosis will be, but a Robertson injury would have a significant impact on the Yankees. It would probably force Phil Hughes back into the bullpen, make Rafael Soriano a huge part of the team's drive for success and rob them of a very effective relief pitcher. That's a lot more worthy of speculation, even the kind of idle speculation that comes with an injury of unknown severity, than eight practice at-bats from a player who only has 9,868 real ones to use as a guide for his actual level of performance. Or 18 or 28 at-bats, for that matter. When the games start counting, that's when it is time to start worrying about how guys are playing. Everyone already knows this, but it's probably not a bad thing to remind yourself once a year when a guy makes an error in an early March game played in Florida.